Design an infobar UI element for VCL. The infobar should be used to offer possible remedies to problems related to the current document, or at least to give information about them so that the user can remedy them himself. The actions found in the infobar must be accomplishable in another part of the user interface. 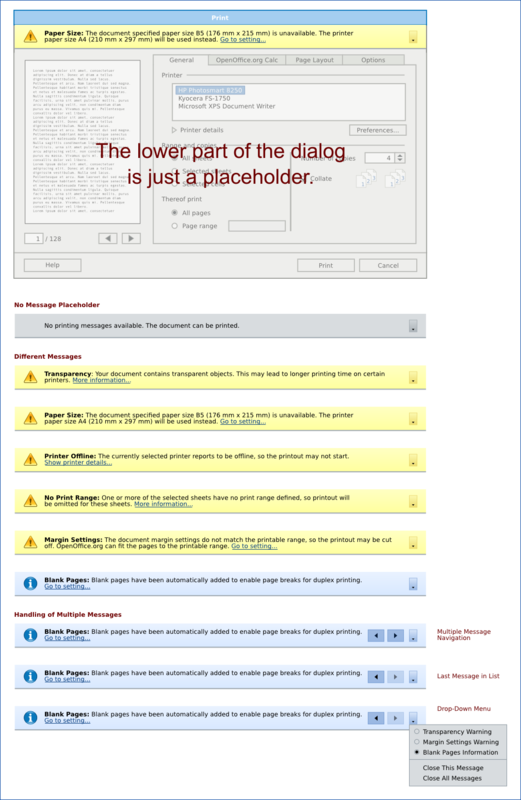 When a problem prevents basic interaction with the document, use a dialog instead. The user doesn't have spell-checking support for the used language installed. There's no hyphenation support for some text due to the language used. Pictures linked to external webpages render slowly or not at all based on the internet connection. A new version of LibreOffice is available. Not document-related, would violate ux-natural-mapping and ux-interruption. User surveys are available. Same problem. Document is being saved in a lossy file format. This could lead to data loss, so a dialog should be used instead. 22x22 icon: This icon should represent the context of the infobar and should indicate where else in the UI the user can find the presented actions. The infobar should stretch across the entire width of the window, below the top toolbars and above the document area. It should be organized into rows with the height of a standard button size and a 6px margin. Contents would be organized into three columns, with the first column reserved for the icon in the top left corner, the second for the text and buttons, and the third for the "Dismiss" button in the top right corner. Multiple infobars would stack. This page was last edited 14:01:05, 2018-05-31 by Dennis Roczek. Based on work by bot and Lera Goncharuk and others.